Save Time. Be A Hero. 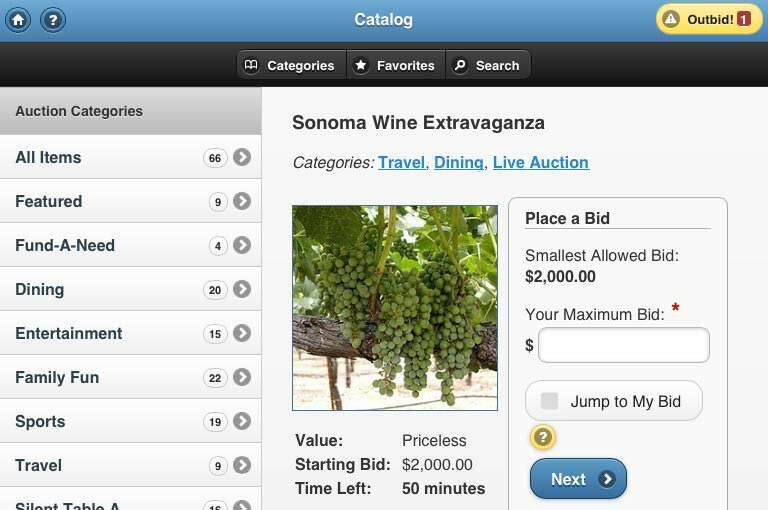 The one-stop, cloud-based auction software solution for your silent, live, mobile, and online fundraiser auctions. 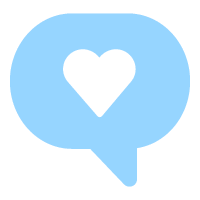 For all non-profit organizations — public & private schools & universities, faith-based groups, sports teams, humanitarian & health organizations, animal welfare societies, workplace giving campaigns and more. Record RSVPs of your guests, assign them to tables and track their meal selections. 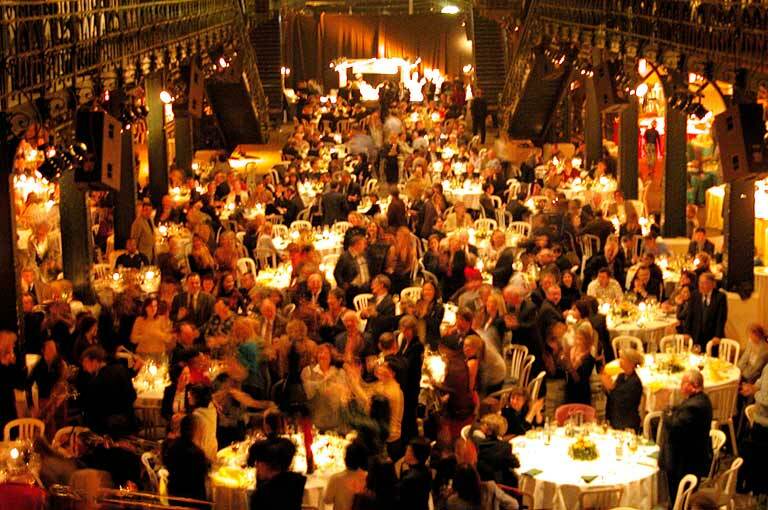 Also organize guests into parties and track who is coming as guests of sponsors. If you don’t have this information prior to your event, it’s no problem. You can assign these attributes to walk-in guests as they arrive. 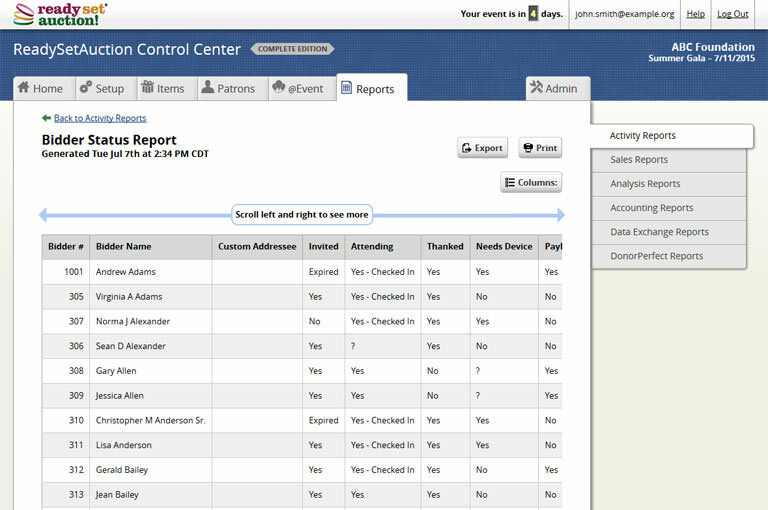 The system even tracks in real time the remaining spaces at each table and in each party, so you’ll never overbook. With ReadySetAuction, it’s easy to track all of your donations including: items and services that will be auctioned off, in-kind gifts, consignment, sponsorships and cash contributions. 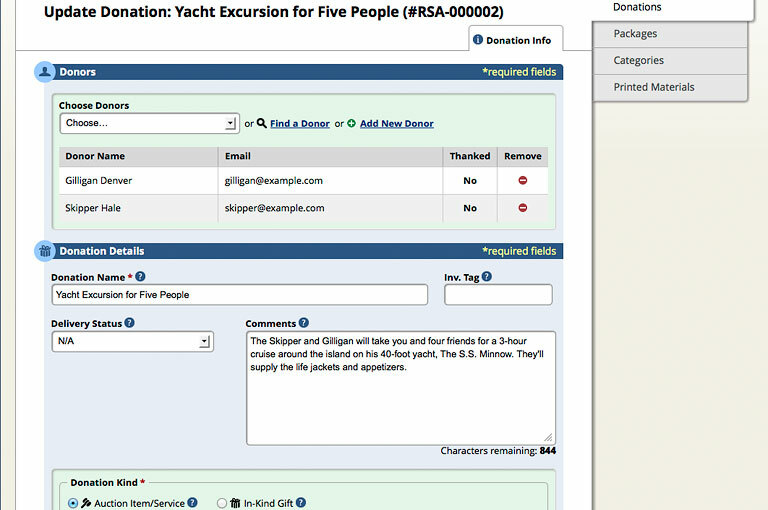 Effortlessly combine donations from different donors into baskets (packages), assign bidding parameters, and decide which packages will appear in your mobile/online auction and which will be featured at your traditional silent/live auction. From the package information you and your committee have entered, ReadySetAuction generates professionally designed, ready-to-print auction collateral. If you prefer more control over the design of your printed materials, then instead use the Microsoft Word versions provided or export the package information report to Excel and merge it with one of our templates or a template of your own design. For up to a year prior to your event, we host an auction website for your organization that you can personalize with your own banner, welcome message, clickable sponsor logos and background color. Send your supporters there to purchase individual tickets, tables and sponsorships for themselves and their guests. 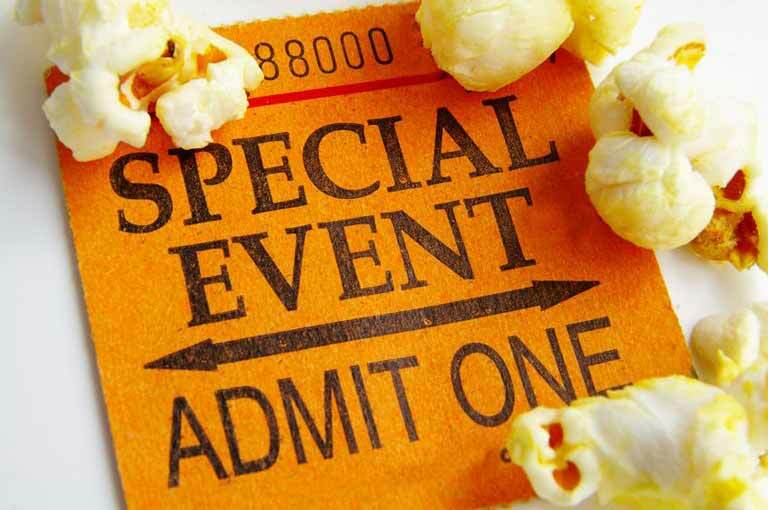 When making a purchase, they can even choose to save their credit cards for the event. With ReadySetAuction, there’s no need to bring in a small army of consultants. Instead, bidders use their own smartphones, tablets and bidding stations that you can set up to browse your auction catalog, place bids, purchase fixed-price items, contribute money and check themselves out. Your venue simply needs a robust Wi-Fi network and/or strong 3G/4G/LTE cellular signals. Plus, we include an easy-to-set up, automated leaderboard-slideshow feature that makes showcasing auction items and sponsors during your event a breeze. Looking to start the bidding online prior to your mobile bidding event? Or do you prefer to conduct an online auction leading up to your event? Or maybe you’d like to hold a fire sale online following your event. ReadySetAuction handles all of your online auction needs. You see, you can set each item to open and close on its own schedule starting the week before your event and ending in the early morning the day following your event. Need longer? Simply purchase pre- and/or post-event extensions to lengthen the electronic bidding window. When we say full-featured, we mean it. Capture your guests’ credit card information at check-in. 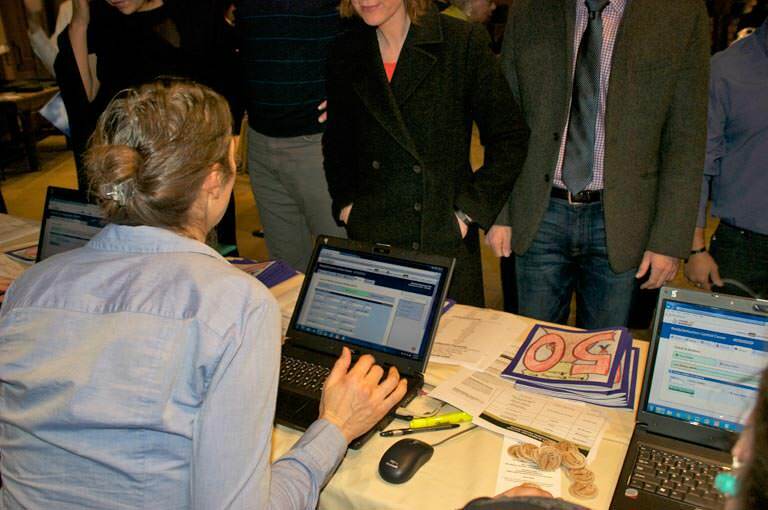 Quickly record winning bids, fixed-price purchases, raise-the-paddle pledges and more during your event. Print consolidated invoices showing what each bidder owes from the pre-event online auction, mobile event bidding, bidsheet bidding and live auction. Check out guests in person by cash, check and credit card. Allow guests to check themselves out from their phones during the event or when they get home. Print and email bidders their receipts for tax purposes. ReadySetAuction’s wide range of post-auction reports export directly to .csv formatted files that you can open in Excel to further manipulate. Who bought what, with what form of payment, for how much? How did packages sell based on margins and percentages? Who still owes you money? These statistics and more are just a click away. Enjoy your success, and give yourself a pat on the back for a job well done! Then when it’s time for your organization to get started on its next event, passing the baton to the next group of volunteers in seamless. Pertinent data – like your bidders and donors – automatically rolls forward, and with just a few clicks the next committee can generate personalized emails and letters to the previous event’s donors and send invitations to the previous event’s guests. Our customers have raised over $250 million. Now it’s your turn. Privacy, dependability, experience and transparent pricing are just a few of the things that set us apart. Q: Do you charge a portion of our proceeds? You keep 100% of your auction proceeds. No hidden fees. No back-end charges. No long-term contract. Take a look at our pricing. It’s simple, honest and very transparent. Q: How far in advance of my event can we purchase ReadySetAuction? No hidden fees. No back-end charges. No long-term contract. Yes, really!